Summary : One of my favorite green teas, despite being a "bagged" tea. This green tea has a delightful, non-bitter taste with a light hint of spearmint. Review : There are lots of bad green teas in the world today, owing no doubt to their surging popularity due to health benefits (never mind you get nearly the same benefits from all teas that come from a tea plant!). Indeed, I have not been impressed by all too many green teas I've tried. Too many cheap green teas tend to be bitter, or have a nasty after-taste, taste like grass, or worse yet - stink up the whole house. So I was very pleasantly surprised when I opened up the foil bag that held Tazo's "Zen" Green Tea. Instead of the smell of a true green tea, I was greeted by a delightful aroma of spearmint. 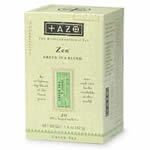 Tazo's Zen Green Tea contains the following ingredients : green tea, lemon verbena, spearmint and natural flavors. Now, I had a very difficult time picking up any sort of lemon flavor in the tea. Instead, this tea has an absolutely delightful taste that somehow perfectly melds "green tea" with "spearmint tea." For those people who do not like traditional green tea - and I can't blame you due to the myriad number of bad green teas available - I STRONGLY urge you to give this tea a try. Despite being a "green tea", Tazo's Zen Green Tea tastes more like a weak spearmint tea, with only the best tastes of traditional green tea apparent. In short, this is the perfect green tea for people who are either new to drinking green tea or for those who currently have never had a tasty green tea before. Last but not least, a word about the after-taste. I found the after-taste to be very nice but not too terribly long-lasting. The after-taste in this tea is by no means comparable to say a true Spearmint Tea. Recommendation : Yes! One of the better green teas you can have, despite coming from a box. The spearmint taste melds perfectly with the green tea. I suppose the lemongrass in the tea does something, but you won't taste it - so don't worry about having a "lemony" taste in this tea. Since there are few green teas I've really liked, I gotta give this tea 5 stars, even though technically it may not be one of my true "favorites." If you want a stronger, more potent "mint green tea", you'll want to try Culinary Teas Mint Green Tea, which has a superb flavor and aroma.